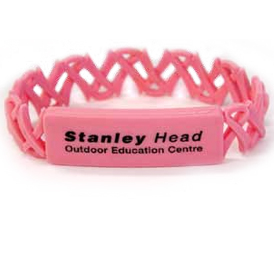 These comfortable silicone bracelets feature a unique RIBBON chain link design that will attract a lot of attention. Silicone ID band has a screen printed design. Imprint Area: 5/8" high x 1-1/2" oval. CWR31G - Please add a $0.10(C) run charge for Glow in the dark silicone with choice of one PMS matched color imprint. Frosty white silicone changes to glow in the dark green, red or blue (choice of one). 3-4 weeks from approval of paper proof or pre production sample.